QT500-7, QT450-10, Low Carbon Steel Or High Carbon Steel By Forged, Etc. A tie plate is also called a baseplate or sole plate. ZHONGYUE specializes in producing rail fastening and tie plate is one of our main products. 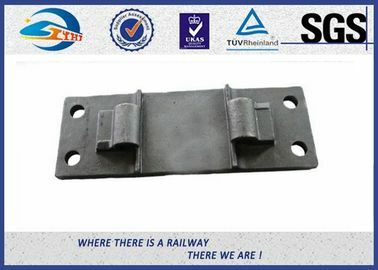 Rail tie plate is used in rail construction to support the rails. We can offer rail tieplate made using either casting iron or casting steel for customers to choose from, depending on the load and the type of rails. Boltable as well as weldable clips can be applied. For the discontinuous type of support, we supply various ribbed tie plate which are also produced in casting iron or casting steel. Tie plates are generally used to take the load of rail and distribute the load to the sleepers offering proven economies. We manufacture all types of base plates suitable for various rail sections, for use on wooden, steel or concrete sleepers and ballast less tracks used with elastic fastenings on wooden sleepers and 'K' type fastening system. plate can be made to suit various rail section, i.e. UIC 60, UIC 54, RN 45, 90 A, etc. As a leading manufacturer of rail fastening based in China, ZHONGYUE also produces many other railway fasteners, such as track bolt, sleeper screw, rail joint bar, rail anchor, rail clip, elastic rail clip, SKL tension clamp, rail shoulder, and so on.